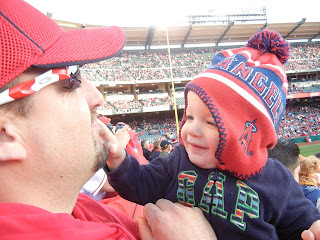 Last Saturday we went to Mark and Molly's first baseball game at Angel stadium. 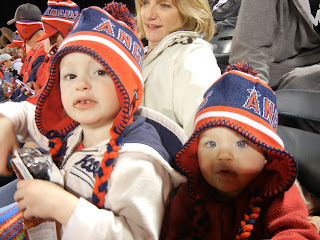 I feel a tiny bit guilty about them going to their first game at 16 months, since we took Isabella at 6 weeks old. (twice in one weekend and then 6 more times before this weekend.) Opps what can I say? It gets harder once you have three kids and we just left them with Grandma and Grandpa last year. We took Grandpa to the game for his birthday. We decided that Saturday night was the perfect night to go since games starts at 6:05 instead of 7:05. On a side note, what's up with the 05? Why not just start on the hour? Now with our brilliant plan in place, we packed lots of snacks and hot dogs and headed to the game. We all got our free Angels ski hat as we walked into the gate. Isabella freaked out when a few fireworks went off during the national anthem. 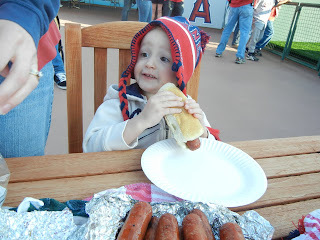 But she calmed down after a little walk and then we finished eating our hot dogs and found our seats. About 5 minutes after we sat down, Howie Kendrick hit a home run for the Angels. Brett was so excited that he was holding Mark when he saw his first home run. The game went really well. Isabella got up once to go potty and we played a game that they have set up for the kids. But for the rest of the game she sat in her seat and eat snacks and cheered on her Angels. Mark and Molly did really good too. Mark spent most of the game on Daddy's lap and Molly went from Grandma to Mommy and back again a few times. Towards the end of the game all the kids got pretty cranky but they held on pretty good. Now wouldn't you know the game went into extra innings. We made until the end of the 10th inning, which I think is pretty darn good for three kids under 4! 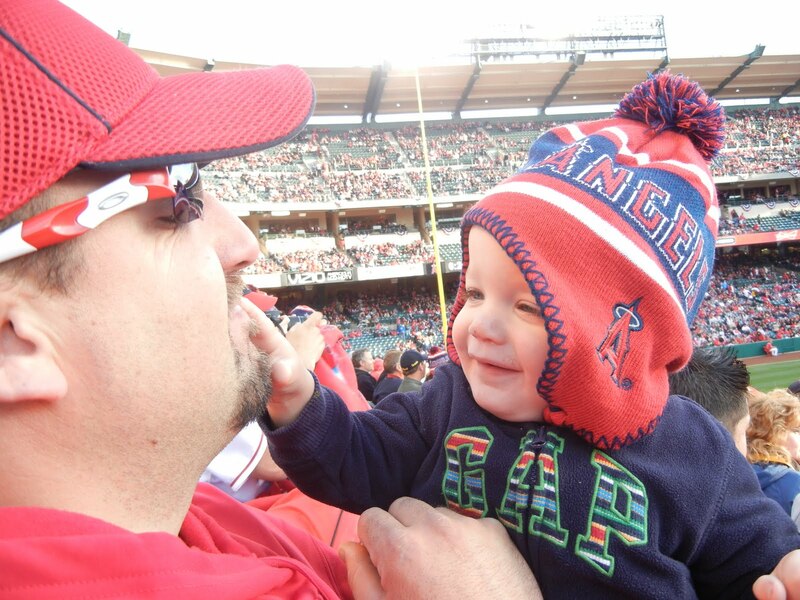 In the end, the game went to 14 innings and the Angels won! It was a lot of fun taking the kids to the game and seeing Isabella root for her team. And don't worry, we'll brainwash the other two kids into being Angel fans too! 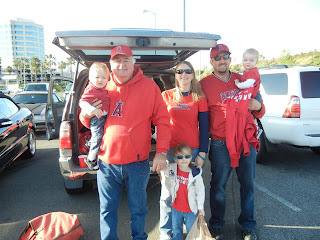 Before the game, say Angels! I just love this picture, the hot dog is as big as Isabella! Daddy and Mark right after the home run. Top of the 10th inning, Molly decides to sit with Isabella. They are just too adorable!!! Love all the photos! The picture of Brett & Mark is priceless!! I can't wait to bring my peapod to her first Yankee game!! You are braver than I am!!! I still can't imagine taking the kids to a Brewers game and one is 6 and the other is 2!!! Following you from the hop. Baseball and kids? What's more fun than that? Glad you all had a terrific time! Following you now.